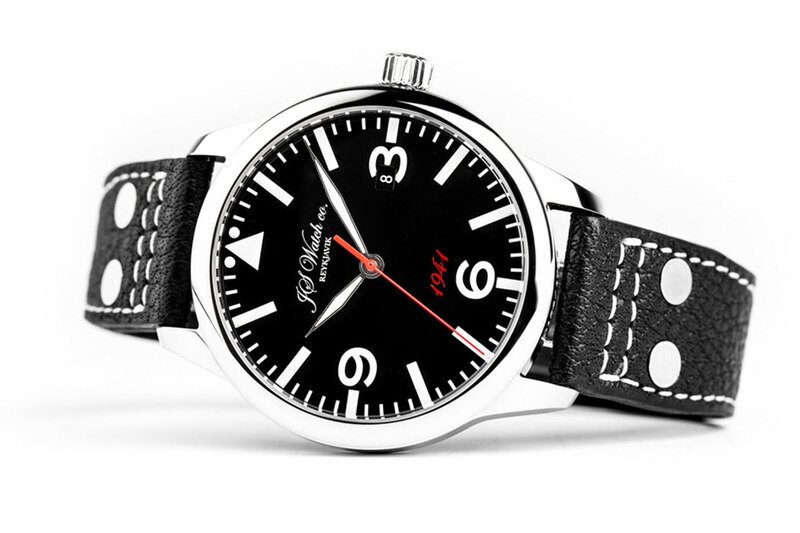 The Frisland 1941 Pilot style watch comes in a 42 mm steel case made from the finest German surgical grade Stainless Steel "316L" with a Curved Anti Reflective Sapphire Crystal and See-through Sapphire Crystal back, it comes with sunburst black or silver dial / Arabic luminous numerals and luminous pilot style hands, handmade 20mm Buffalo pilot strap or Steel bracelet. 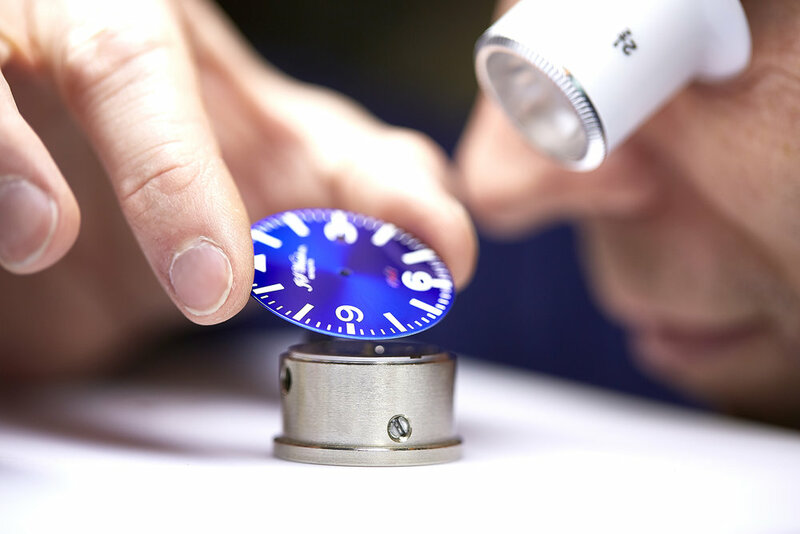 It has a Swiss Made Mechanical movement “Execution Top” with Automatic winding, 25 jewels, Custom decorations, Blue screws and Rhodium plated finish, which can be examined in detail, through its sapphire crystal case back. The decoration is in the highest traditions of craftsmanship. 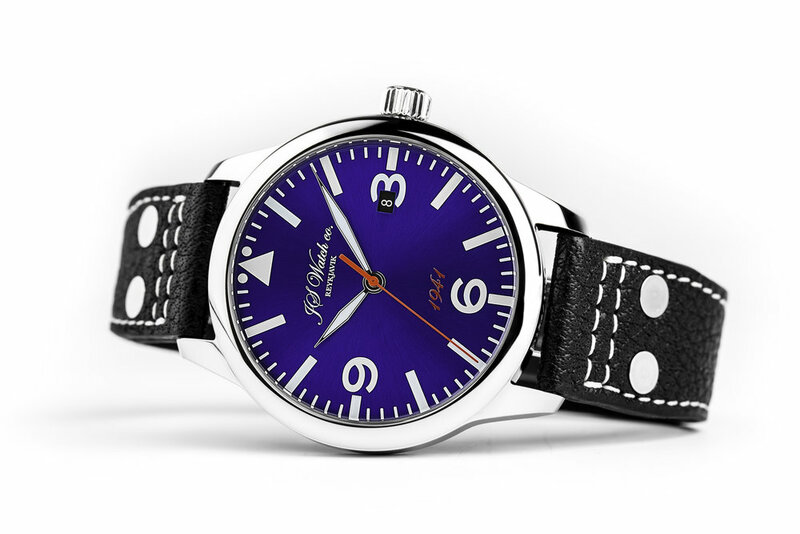 The Frisland 1941 Pilot style Collection comes in a 42 mm steel case made from the finest German surgical grade Stainless Steel "316L" with a Curved Anti Reflective Sapphire Crystal and See-through Sapphire Crystal back. 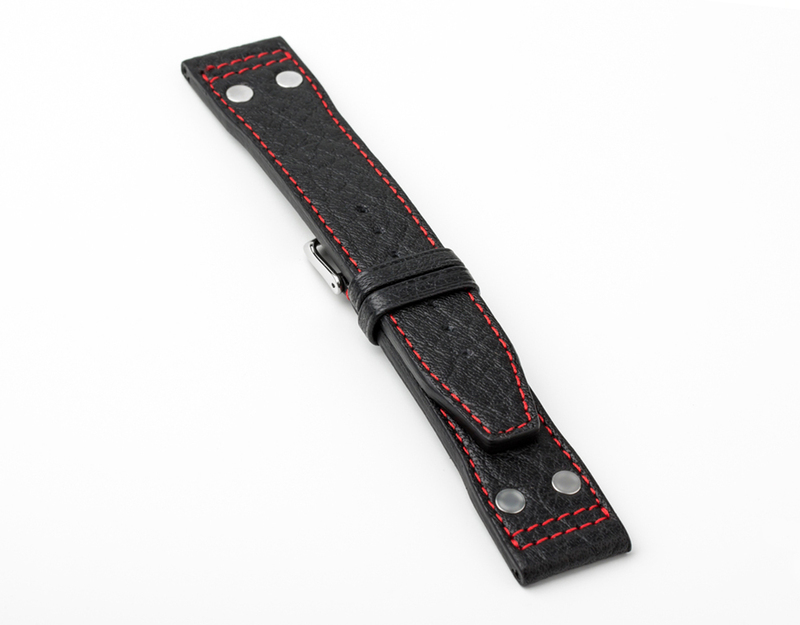 It comes with a sunburst black or silver dial / Arabic luminous numerals and luminous pilot style hands, handmade 20mm Buffalo pilot strap or Steel bracelet. It has a Swiss Made Mechanical movement “Execution Top” with Automatic winding, 25 jewels, Custom decorations, Blue screws and Rhodium plated finish which can be examined in detail through a sapphire crystal case back. All decorations and craftsmanship is of the highest quality. 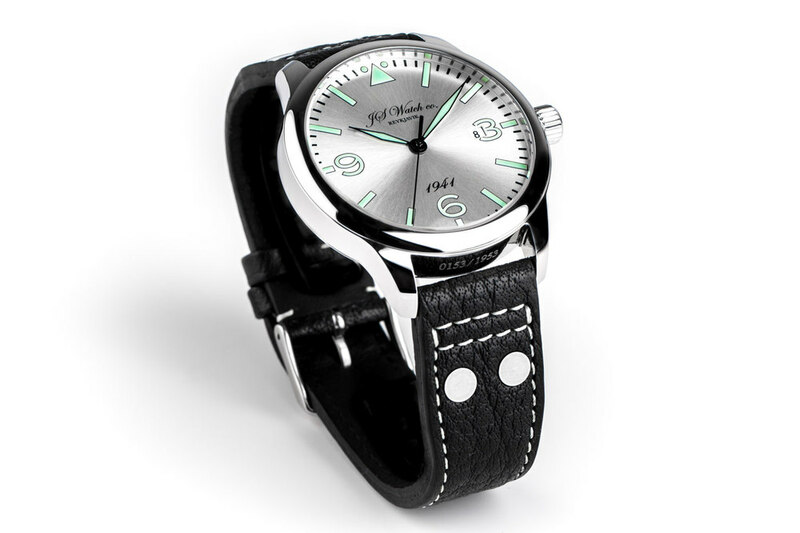 Material: Surgical grade German Stainless Steel "316L"
White or Green Super-LumiNova material on numerals and hour markers. Date display at three o'clock. 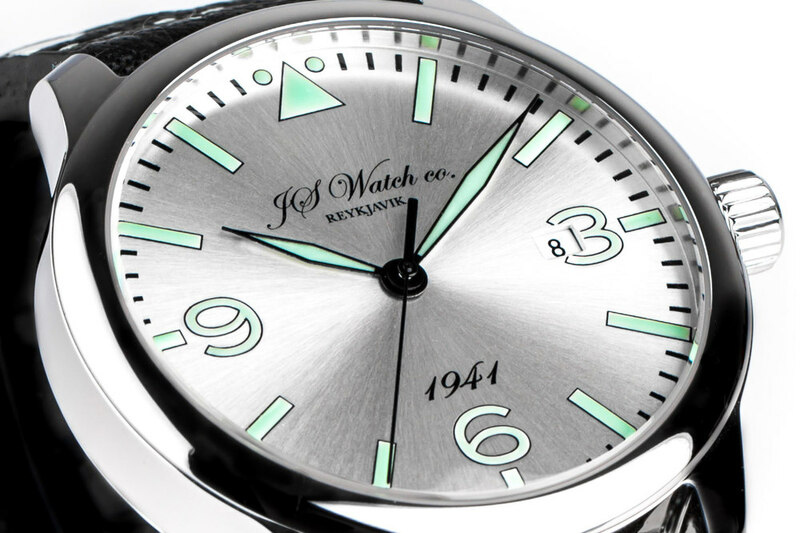 Pilot style hands, rhodium plated with white or green Super-LumiNova. 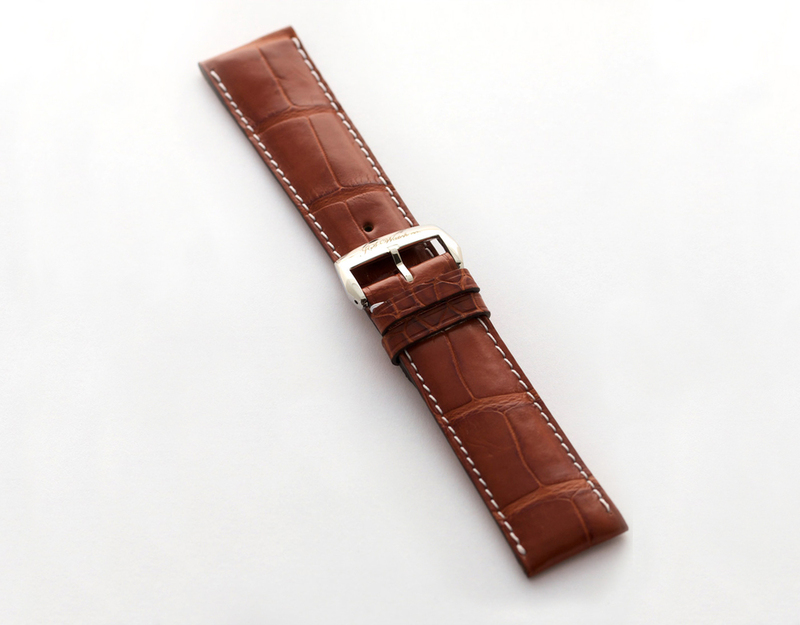 Handmade 20mm Buffalo pilot, Genuine Alligator, Ostrich or Calf skin with JS Watch co. Reykjavik buckle or optional deployment clasp. Reykjavik airport celebrated its 70th birthday in July 2011. There was a big airshow and also the history of the airport on display. Honorary guests where six British Royal Airforce pilots who where stationed in Iceland when the airport opened in 1941 during the second world war. The current airport was built by the British army during World War II on the south coast of Reykjavík peninsula, then a small town. Construction began in October 1940, when the airport had only a grass surface. The Black Watch regiment built the first runway, constructing the piste over sunken oil barrels and In July 1941, the first runway opened. On July 6, 1946, the British handed the airport operation over to the Icelandic government and since then it has been operated by the Icelandic Civil Aviation Authority. The city has grown around the airport and it is now located in the western part of the city. This location is considered inconvenient by many, for noise and safety reasons and because it takes up a lot of valuable space in a central location. This central location is also the reason why many wish to keep the airport where it is, as it is a vital link between the capital and the sparsely populated rest of the country. There is an ongoing debate about the future of the airport, with the three options being keeping the airport as it is, building a new one in the Reykjavík area, or closing it and moving domestic flights to Keflavík. The first choice would make it impossible to develop the highly valued land. The second choice would be most expensive, and the third one would hurt the domestic service, reducing access to vital institutions in the capital such as hospitals. The third option would give better connections between other parts of the country and the rest of the world. 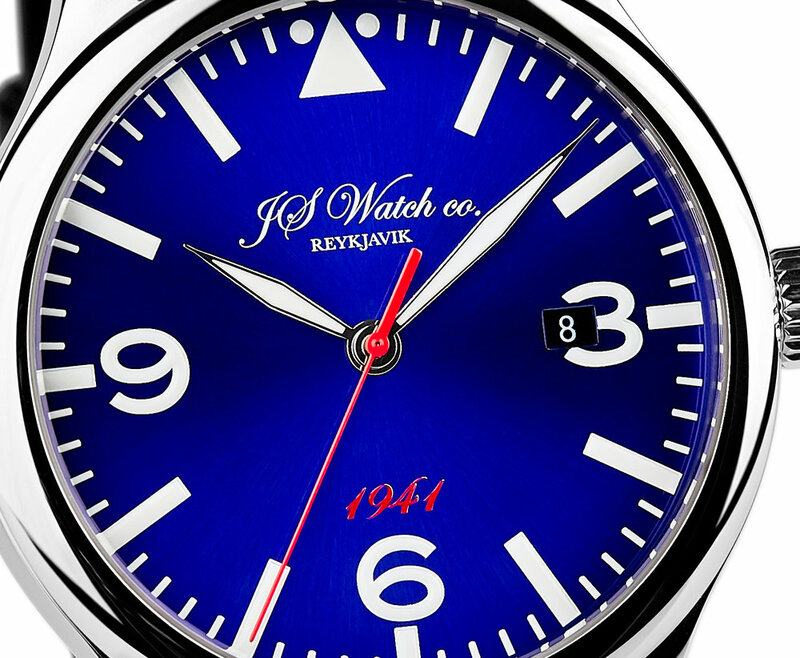 When designing this watch we found it very appropriate to name it Frisland 1941 in honor of the 70 Year history of the Reykjavik airport and it's unsecure future location.